Shadow business secretary Ken Clarke says the Tories will not reopen negotiations on the Lisbon Treaty if the Irish back it in a new referendum. The Irish Republic rejected the treaty last year, but could hold another vote. The Tories have said they will call a referendum if they win power before all EU states ratify it, but have not said what happens if the Irish vote yes. Tory party central office denied its position had changed but Labour said Tory policy was "in disarray". Tory leader David Cameron has previously only said that if the treaty is ratified by all EU member states before a Conservative government comes to power he would "not let matters rest". His party argues that the treaty was an EU Constitution in all but name. But in an interview with BBC One's The Politics Show, Mr Clarke - one of the party's most prominent supporters of Europe - said: "If the Irish referendum endorses the treaty and ratification comes into effect, then our settled policy is quite clear that the treaty will not be reopened. "But it has also been said by David Cameron - and he means it - that it will not rest there, and he will want to start discussions on divisions of competence between national states and the centre of the EU." He said the party would want to open negotiations about a "return of some responsibilities, particularly in employment law, to individual nation states". He added: "We are not talking about a solemn treaty renegotiation. We are talking about sensible discussions about the proper division of responsibilities between nations and the EU in limited areas." 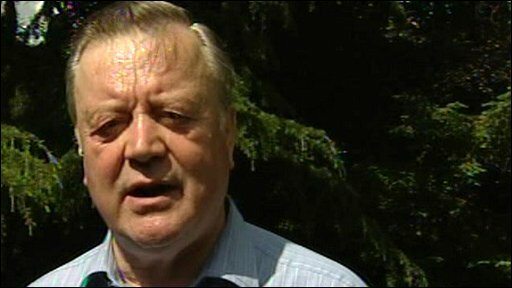 BBC Political correspondent Gary O'Donoghue said: "I think, in a sense, he's [Ken Clarke] freelancing here a little bit. "The party was quick to say there had been no change in policy. The sources that we have spoken to believe that this was a bit of a gaffe." A Conservative Party spokesman contacted after Mr Clarke's appearance said: "There is no change to Conservative policy. "As Ken Clarke explained if the Lisbon Treaty is ratified and in force across the EU by the time of the election of a Conservative government, we have always made clear that we would not let matters rest there." But Foreign Secretary David Miliband said Conservative policy on Europe was "in disarray". "Kenneth Clarke knows that Tory policy 'not to let matters rest' on the Lisbon Treaty is hare-brained and dangerous for British business, but his leader and shadow foreign secretary are committed to it," he said. "The country deserves a clear answer: has Conservative policy flip-flopped, or are the Conservatives just divided and incredible in their foreign policy?" UK Independence Party leader Nigel Farage said: "Ken Clarke has just let the cat out of the bag. "The Conservatives have no intention of holding a referendum on the Lisbon treaty and all their promises during the European election campaign about holding one can now be seen to be sheer, brass-necked dishonesty. " And Eurosceptic Tory MP Bill Cash demanded to know on what authority the shadow business secretary was speaking. He said: "It appears that Kenneth Clarke has reinvented unilaterally Conservative Party policy on the whole of the Lisbon Treaty and European policy." MPs rejected a Conservative motion to put the Lisbon Treaty to a UK-wide referendum in March 2008 and it was ratified in July 2008. But the constitution was rejected at referendums by Dutch and French voters later that year - the Lisbon Treaty was drawn up to replace it.